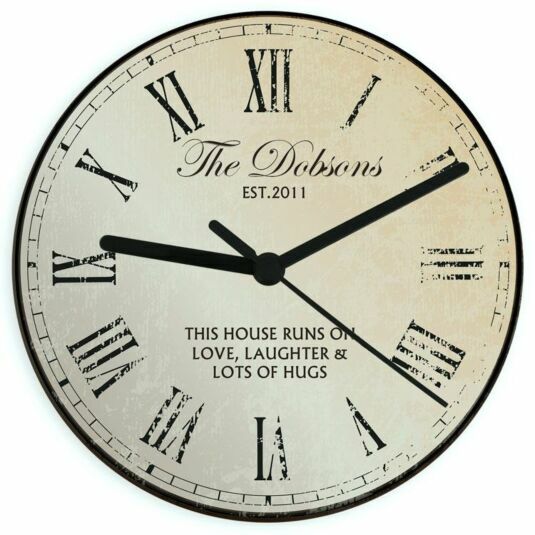 Add a rustic touch to any room throughout the house with this personalised glass clock. Beautifully styled in a worn and distressed design, this clock uses Roman numerals for digits and classic typefaces to achieve a true rustic and authentic feel. Made from glass, this elegant clock features an hour, minute and second rotating arm. Requires 1 x AA battery for operation (not included). Add a message across 2 lines of text, with a maximum of 15 characters per line, to appear above the centre point of the clock. Due to the font type used please refrain from using only capitals in Line 1, as you may find the personalisation extremely difficult to understand and may even result in personalisation being missed off the product. Add a further 3 lines of text, with a maximum of 30 characters per line, to appear below the centre of the clock. These lines will automatically appear in UPPER CASE. All 5 lines of personalised text must be filled to complete purchase.